Abstract Fiber is building a pretty new website! In preparation, we’ve been taking tons of new photographs of yarn and fiber. You can see the pictures by searching Flickr for Abstract Fiber, or by following the link from AbstractFiber.com. We’ll be adding more photos, and keeping them on Flickr so you can browse anytime. Most of our yarn colors are available on all yarn bases, so if you see a color you like, you can have it in the yarn you want. As always, shipping in the US is free for orders over $100 at AbstractFiber.com. Gigi is working on a pair of tiger striped socks from "Campus Knits". Jasmin is working on the Twist Cardigan for Meghan (from the Stitch It! podcast) as part of Sweater Swap 2010. Jasmin is also working on the Cabled Raglan Tunic and learned to cable without a needle when she misplaced her Wanda tool. Jasmin talks about knitting with apricot colored Dream in Color Smooshy. Katrina has completed her Tour de Fleece spinning, which was blue cormo that she bought at the Retzlaff Winery spinning day. She spins on a Kromski Sonata and talks about "re-booting" her wheel. Katrina also worked on the Crown Mountain Farms Targhee, which she Navajo-plied. She also tried her hand at the Crown Mountain Farms Lincoln. She started spinning the black and blue Shetland batts from Sporfarm. She has also learned both the provisional cast-on, and the modified continental bind-off from the Lucy Neatby DVDs. Katrina also learned to wet block the Brandywine and the Citron shawls. Gigi has finished all of the repeats from the first chart. One of our listeners alerted her to dental floss ("with a fuzzy middle"), which seems to be the secret to speedy beaded knitting. Gigi found the information in the @Romi's Studio group; Jasmin found it on Rosemary's blog. (Hooray for Oral B Superfloss!) Jasmin declares ennui. This week we review Sock Club by Charlene Schurch and Beth Parrot; we love it! 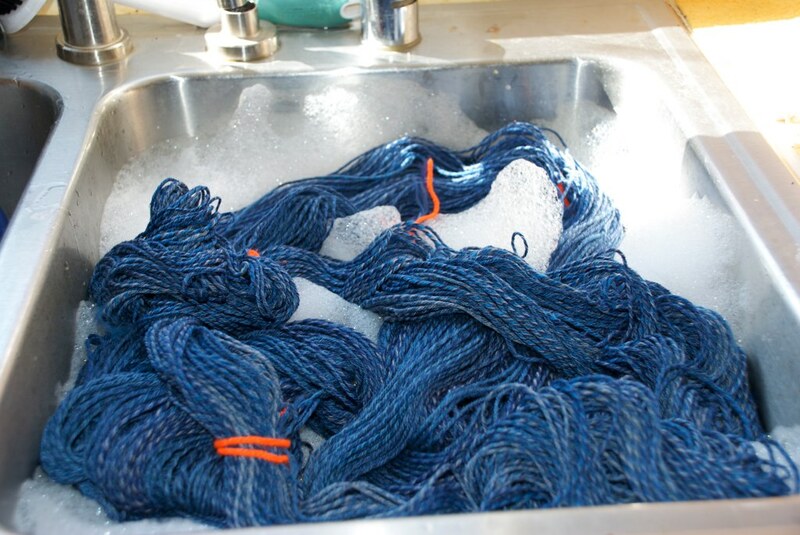 Introducing Abstract Fiber Alto: 100% SuperWash Blue Faced Leicester in a 3-ply DK weight yarn. Shiny, very soft, just the right amount of twist. You should see how this yarn takes color! There is something magical about the way the colors smudge together and create new shades in between. Add the sheen, and it’s almost too pretty to sell. 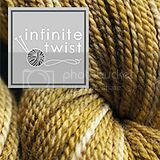 Perfect for sweaters, scarves, wrist warmers, just about anything. 4.5 ounces of Alto is nearly 400 yards and only $20. We think you’ll love Alto as much as we do. Find Alto online at AbstractFiber.com. Knitter’s Magazine brings you the very best in the Knitting Universe. Each issue offers something for every knitter—easy step-by-step instructions, how-to techniques, informative articles, and the best designs from the most talented designers. We’re Knitter’s, it shows. Gigi is one seam away from completing her Frost Flowers Stole. Jasmin is working on the Cabled Raglan Tunic by Cheryl Oberle, with the shaping from the Twist cardigan (by Bonne Marie Burns) overlaid onto it. We talk about the Vanilla Sweater thread in our Ravelry group, and some of our favorite vanilla sweaters include the Incredible Custom-Fit, Neckdown Raglan. We discuss tunics and body shapes. Gigi's Aeolian has made some progress. We mention Rosemary Hill's bead tutorial. Gigi is knitting a baby hat using the Gull Wing pattern from Chrissy Gardener's Toe-Up! book. Jasmin talks about the Great Sweater Swap of 2010. Jasmin is knitting the Twist Cardigan out of Cascade 220 in color 9411 for Meghan. We discuss whipping cables into shape, and learning techniques. We suggest the Lucy Neatby Knitting Gems 3 DVD for cable-specific help. Gigi's Frost Flowers Stole hit a snag. Jasmin goes on the hunt for her Leslie Wind cable needle, and it turns up with a project that she really should finish. Gigi has done 6 repeats of the first chart on her Aeolian shawl. Handcyclists, please post to the Team Sasquatch board. Jasmin has spun 10 of the 24 ounces so far, but has suffered some minor equipment failure. Jasmin replaces Miss Kalendar's driveband. Jasmin talks about spinning Lincoln. She doesn't like it. Luscious laceweights are favorites for summertime knitting. At Purlescence Yarns we have a lovely array of laceweight yarns at 25% off July 7-12. From silk to merino to cashmere, we have what you need to make your lace knitting dreams come true. We're knitting Citron from Knitty.com in Madeline Tosh Prairie, Punta Mericash, & Claudia Silk. Call or email us with your order today! Gigi is making good progress on her Frost Flowers Stole. Jasmin has cast on a black cashmere Citron. Jasmin mentions her Knitmore Citron. Gigi has cast on the Aeolian Shawl out of Abstract Fiber MightySock (in Silver). Jasmin is knitting the Cabled Raglan Tunic by Cheryl Oberle out of Malabrigo in "Orchid". Thanks to Abby and Mr. Feibusch for the perfect zipper! Jasmin announces casting on her Somewhat Secret Project. Katrina, the intern does her introduction to the segment! Please post any questions you'd like her to answer in the Ravelry thread. This week, we recommend scanning patterns into your computer as you buy them. Gigi hits a snag with her Tour de Fleece project. We talk about watching "Moon" while we Tour! Day 2 of the Tour de Fleece, we talk about our progress (or lack thereof). Jasmin is spinning BFL in "Jeans" from Susan's Spinning bunny, and a similar colorway in Lorna's Laces wool. Miss Kalendar is spinning dyed cormo from Sue Reuser. Gigi is stuck on beads. This week we review "Knit in Comfort " by Isabel Sharpe. We don't like it, give it a pass. Jasmin talks about Targhee, courtesy of Crown Mountain Farms "Fiber of the Month" club.